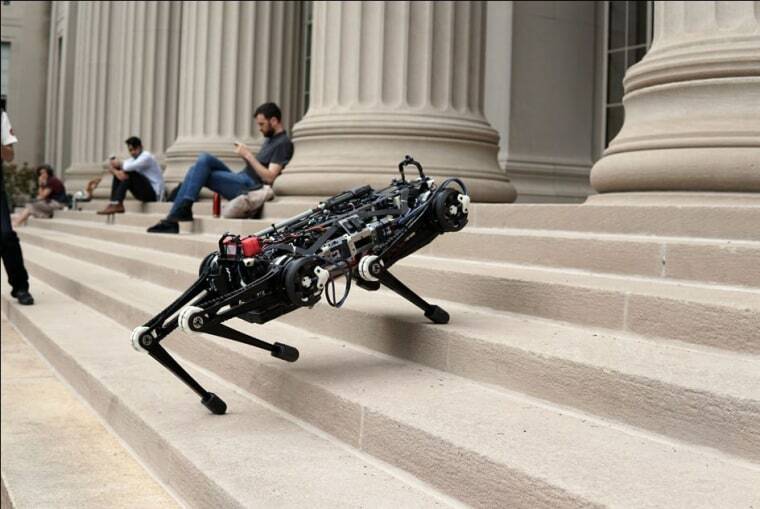 Scientists at MIT have created a four-legged robot that can climb debris-ridden stairs and leap almost three feet into the air, but the ominous-looking catlike bot — dubbed "Cheetah 3" — is intended not to hasten the robot apocalypse but to help bring about a new generation of first-responder robots. As seen in a video released by the university, the 90-pound, retriever-sized robot navigates with touch sensors rather than cameras — a bit like the way humans feel their way when it's too dark to see. “Cheetah 3 is designed to do versatile tasks such as power plant inspection, which involves various terrain conditions including stairs, curbs and obstacles on the ground,” Sangbae Kim, an associate professor of mechanical engineering at MIT and one of the robot's developers, said in a statement. Kim plans to give Cheetah sight, but for early tests he wanted to keep the robot in the dark. "In order to be as agile as animals, including humans, we need to have a great blind controller first before relying on vision," he told NBC News MACH in an email. Robin Murphy, a professor of computer science and engineering at Texas A&M University, sees big potential for search-and-rescue robots that maneuver with touch technology. Such bots could navigate in areas shrouded in darkness or obscured by airborne dust, said Murphy, who is not involved in the Cheetah project. “It would be so great when that technology that they're showing matures and could be added to the robots that are the size of a shoebox,” she said of the MIT researchers' work. Small bots, of course, are able to get inside nooks and crannies too confined for humans — and relay information that human rescuers can then use to extricate victims of building collapses, for example. “If you just start excavating, you could possibly trigger a secondary collapse that would kill the survivor or another survivor that you haven't found yet,” she said. Search-and-rescue robots aren't new, but Cheetah 3 is one of many new bots now in development. Last fall, Honda unveiled a five-foot-tall robot that can rotate its torso 180 degrees in order to climb steep stairs. Last February, the Italian Institute of Technology released a video showing its WALK-MAN humanoid bot wielding a fire extinguisher. Next year, Kim and his team plan to equip Cheetah 3 with robotic arms that can be controlled by a human operator. They aim to have a commercial version of their bot ready in five years. David Freeman contributed additional reporting.